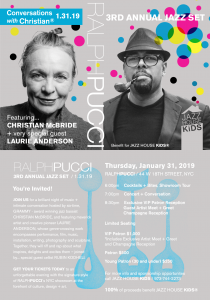 On Thursday January 31st, RALPHPUCCI hosts its 3rd Annual Jazz Set, “Conversations with Christian,” and intimate conversation and concert with musical pioneer and maverick artist LAURIE ANDERSON and our host, six-time GRAMMY award winning bassist CHRISTIAN McBRIDE. Last year, together with JAZZ HOUSE KiDS, we brought you ESPERANZA SPALDING and the year before that JOHN PIZZARELLI. This year’s event gives you a behind the scenes look at the genius of the unconventional pairing that captivated audiences at the Newport Jazz Festival this summer, in an intimate and exclusive setting. The music of Anderson and McBride defies convention in the name of innovation, admirable traits echoed in the storied history of RALPHPUCCI . 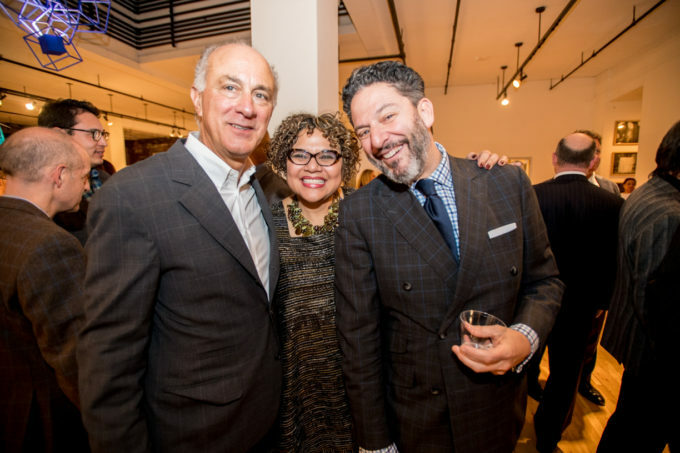 Join us at the New York gallery on Thursday January 31st for the RALPHPUCCI 3rd Annual Jazz Set. Seating is limited so get your tickets today! The evening will benefit JAZZ HOUSE KiDS, a nationally recognized nonprofit music education organization with a mission to transform young lives through music, mentoring, education and apprenticeship. The event is co-sponsored by CallisonRTKL and DEDAR Milano. JAZZ HOUSE KiDS provides access to music education with more than 1,000 hours of annual classroom instruction in underserved school districts, and offers 20 instrumental and vocal jazz classes at the Jazz House for ages two through adult. The organization also places instruments in the hands of young people who want to play but can’t afford instruments. Since 2002, more than 50,000 students have participated in JAZZ HOUSE KiDS music education programs in the schools, at the JAZZ HOUSE and have performed for more than half a million people in the community. With an emphasis on access and inclusion for all young people, JAZZ HOUSE KiDS provides more than 40% of its student body with tuition assistance to see its mission flourish.